We all wish to receive God’s grace and experience warmth of his love. The story of Lord Vitthal taking away Saint Janabai’s Godhadi (Quilt) and forgetting his own Shela (scarf) is famous. The story underlines the greatness of the Godhadi. But many who toil hard do not even manage to get a quilt. It is for these men and women that Sadguru Aniruddha Bapu conceptualized and launched the project of ‘The Warmth of Love (Mayechi Ubb)’ under his ‘13-Points Programme’ and also explained the significance of it. Godhadi which not only protects the needy from cold, but it (project) also provides love and affection, and facilitates for the three basic needs i.e. food, clothing and shelter. 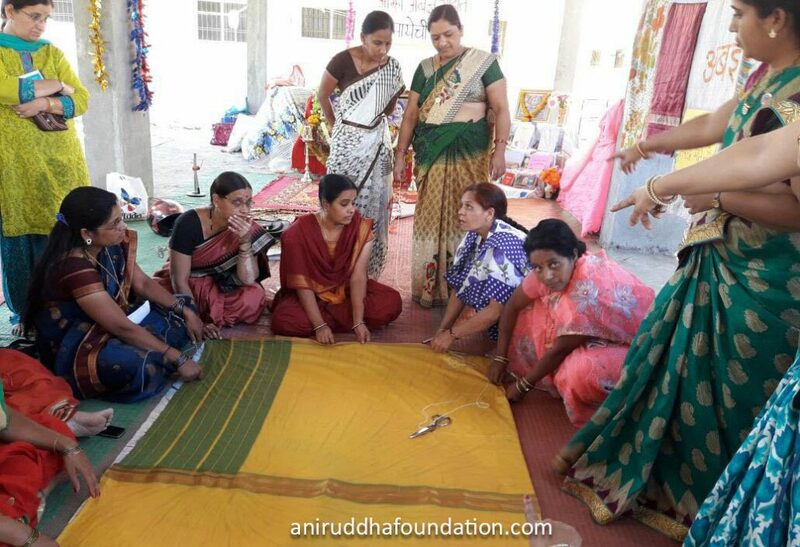 Both men and women are trained to make Godhadis from old sarees and bedsheets. The stitches of the Godhadi are purposefully made very small and delicate to prevent the earrings and anklets of the small children from getting stuck in them. These quilts are also purposefully made light-weighted so that the pregnant women too can wash them. All the four sides of the Godhadi are stitched to be closed in such a way that the insects, earthworms and snakelets cannot penetrate through them, even in the tribal forest areas. There is a difference between the quilts sold in the market and those made by shraddhavans as they recite God’s name while making these Godhadis and do it with great devotion. Hence these quilts have a touch of love in them which cannot be described in words. Anyone who uses these quilts, does not get to know who has made or donated it. But the warmth of affection that comes with it provides a serene calmness to the person. People who get the Godhadis can be seen wearing a cheerful smile on their faces while those who have made these Godhadis get a tranquil satisfaction! Another important thing is that the blouse pieces offered to Goddess Mahishasurmardini (Mothi aai) and the uparna’s offered to Shree Dattaguru at Shree Aniruddha Gurukshetram, can also be used to prepare Godhadis free of cost. It can be said that the needy get warm touch of the love of Mother Mahishasurmardini and Anasuyamata through these Godhadis. The Godhadis are distributed for free to the needy and the poor during the Medical Camps held every year at Kolhapur and Virar. During the July 26, 2005 Mumbai floods,the Godhadis were distributed to many needy families.We pray at the Lotus Feet of Sadguru that the warmth of love and affection may always be granted to the needy.